Houston Astros ace Justin Verlander will face off against his Boston Red Sox counterpart, Chris Sale, when the two teams meet in Game 1 of the American League Championship Series on Saturday. Price's nod is perhaps the biggest surprise of the group. The left-hander has a history of struggles in the postseason as a starter, a narrative that was strengthened by his performance in Game 2 of the American League Division Series against the New York Yankees. Price allowed three runs on three hits -- two of which were home runs -- and two walks in 1 2/3 innings against the Yankees. "We trust him," Red Sox manager Alex Cora said after Price's rough start. "He bounced back before. We'll talk to him and make a few adjustments, and we'll go from there." Sale and Verlander facing off is a rematch of Game 1 of last year's ALDS between the Red Sox and Astros. Houston won the contest 8-2 , with Verlander allowing two runs in six innings to earn the win. 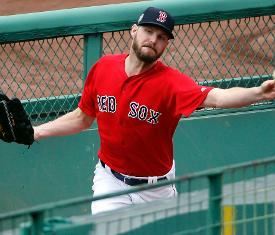 Sale allowed seven runs on nine hits -- three home runs -- in five innings. The left-handed Sale beat the Yankees in Game 1, then came out of the bullpen to pitch the eighth inning of Boston's decisive Game 4 victory on Tuesday. Sale threw 13 pitches in a perfect frame.